Debt management plans and debt consolidation companies are often not designed to help you get out of debt. Instead, they are built to be yet another piece of the debt cycle, trapping people in a system of smaller payments over a longer time, resulting in a larger total payment in the end. DebtCleanse wants to offer a way out that is actually a way out. A debt plan for people that can't pay. Over $12 trillion in consumer debt is originated each year. Of this, $317 billion goes unpaid and is charged off, meaning that the creditor gives up on collecting, writes off the debt, and typically assigns it to a collection agency or sells to a debt buyer. Many other debts go delinquent, but debtors struggle to make some payments and keep the debt from being charged off. The reality is that these debtors would better their situations by not paying anything and letting the creditors charge off their debts. $150 billion to $200 billion of these charge-offs end up in the hands of collectors, which typically recover between 20% and 25% of what is due. You want your debts to be in the 75% to 80% that are never collected. Debtor: You, the one who owes the money. Creditor: The entity to whom you owe money. Also known as the Lender. Debt Buyer: The entity that will hopefully buy your delinquent debt at a big discount from your Creditor. Debt Collector: The entity that the Creditor or Debt Buyer may contract with to collect the debt from you. Sometimes, Debt Collectors receive a contingency fee, earning a percentage of what is recovered. May also be known as a Loan Servicer or Collection Agency. Fair Debt Collection Practices Act: a consumer protection amendment to the Consumer Credit Protection Act, which establishes legal protection from abusive debt collection practices. The Act also provides consumers with an avenue for disputing and obtaining validation of debt information in order to ensure the information’s accuracy. The terms Creditor, Debt Buyer, and Debt Collector are often used interchangeably and can also be simply known as Debt Holder. Originators, a term which also includes third-party brokers or dealers which work with borrowers to complete financing transactions)*. For example, I once had a Southwest Airlines Rapid Rewards credit card issued by Chase Bank. Chase was the Creditor and was not bound by FDCPA. In 2006, when I stopped paying the credit card, Chase assigned the debt to a collection agency, which was bound by FDCPA. The debt was later sold several times to different debt buyers, all of which were bound by FDCPA. It’s now 2015 and I never paid anything on the debt. Deficiencies: These are errors made by Creditors, Debt Buyers, and Debt Collectors. These can include faulty and missing documentation, incomplete and lost records, defective and inaccurate legal pleadings, improper and illegal collection efforts (including FDCPA violations), and many other boo-boos. Deficiencies are common amongst all types of debt. Discount: The difference between the amount you owe and the amount your Creditor sells to a Debt Buyer for; and from debt buyer to debt buyer, and so on. Time: This is always the debtor’s friend and creditor’s enemy. In almost all situations, delaying debt resolutions will benefit debtors. Allonge: An attachment to a Promissory Note, which transfers, or purports to transfer, ownership of the Note. This can also be accomplished by an Endorsement directly on the Note, similar to signing over a check. For instance, an Allonge or Endorsement or similar document transferred my unpaid credit card obligation from Chase to a debt buyer. Assignment: Document that transfers ownership, often of a Security Instrument or other evidence of a debt. Note: The document in which one party promises to pay another party on specific terms. Also known as Promissory Note. Security Instrument: Document that evidences the pledging of an asset as security for a loan. This includes a Mortgage and Deed of Trust. Register here to sign up for the waitlist. 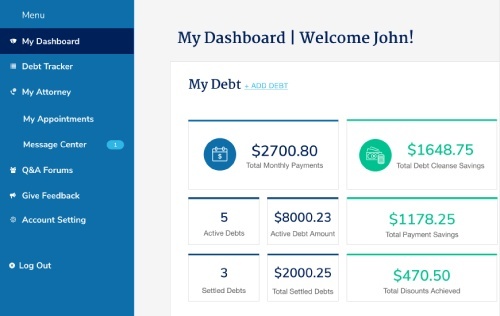 Once the platform launches in early 2019, both premium and free members will be able to access tools to streamline your Debt Cleanse, including the Debt Tracker. Keep an inventory of every debt you have. Confessing every debt problem may be nerve-wracking. Go ahead, though, and pull out all your statements, or go online, to get the exact balances. Don’t worry about writing down the monthly payment amounts—you aren’t going to be paying any of these. You can also get details on your debts by obtaining free copies of your credit reports at annualcreditreport.com. This needs to be a complete inventory, so do not leave anything out, no matter how small or seemingly insignificant, such as the “four easy payments” for that dull knife set you bought off TV. There, all your debts are contained in one place. Expect that some of your debts will be sold or assigned to collection agencies, so plan to update debt contact names as needed. There may be multiple transfers, which is good. Presumably, every time your debts are sold, they are sold for smaller and smaller amounts. Asset protection is ideally done before you start to Debt Cleanse. The goal is to get assets out of your name. For instance, my name is Jorge P. Newbery and I do not want anything in my name: real estate, vehicles, bank accounts, ownership in a company, beneficial interests in a trust or estate, jewelry, furniture—nothing. Think of Asset Protection like going through TSA at the airport. If you have water, drink it up. If you have a pocketknife, mail it to a family member. Whatever you hang on to, you will likely have to give up to the TSA screeners. 50% of Americans have no net worth—that is, the value of whatever assets they own equals (or is less than) whatever they owe. In fact, 25% of Americans have a negative net worth, owing more than the value of what they own. Thus, for at least half of the readers of this book, there are really no substantial assets to protect. This is good—great, even—as this will make your Debt Cleanse easier. What we are trying to avoid is leaving any asset vulnerable to seizure by a creditor who is able to obtain a judgment. Your goal is to own nothing. If you have no real estate and modest assets, you can transfer your stuff to a friend or family member. In community property states such as California, transferring to a spouse will leave you with an ownership interest, so a parent or adult child might be best. For instance, I live in Illinois (not a community property state) and my wife owns all of our furniture, our TV, our food, even our dog. She lets me use these, of course. I don’t much like the dog though, so sometimes I am tempted to license him in my name in hopes that one of my judgment creditors will take him. If you have real estate, a car or boat, a business or business equipment, jewelry, or a watch, or any single items worth more than a couple of thousand, ask this question for each item: Do you have a loan (or loans) secured by this item that exceeds the value of the asset? If so, there is no equity, so nothing for a creditor to take. Sell the item and keep the cash. Transfer ownership to a friend or family member. Remember, if you are in a community property state, do not transfer to a spouse. Transfer ownership to an entity such as a Limited Liability Company, Corporation, or similar structure. The law treats these entities like separate people. Note that the asset may need to have a business purpose, which could be to rent the asset to you. For instance, I, Jorge Newbery, have virtually no assets. However, I exercise some control over several LLCs that do have assets. As an example, the Debt Cleanse book is published by Community Books LLC, an LLC that I control which earns a couple of bucks from every book sold. There is a debt buyer holding a purported $8 million judgment against me. The judgment holder can ask a court to grant a charging order, entitling the judgment holder to any monies paid by the LLC to me. However, the creditor does not have any management rights to make decisions for the LLC. Thus, even as Community Books LLC earns money, pays expenses, and accumulates cash, the judgment holder cannot force the LLC to pay me, so there is nothing for the judgment holder to intercept. All the judgment holder would get from a charging order is some bills from their attorney. In ancient Rome, slaves were taken to the slave-markets where they were paraded naked with placards around their necks explaining their best and worst qualities. Think of credit scores as the modern-day slave placard. In today’s America, if you are a good slave and earn a good credit score, you can buy the cool stuff that marketers tell you is needed in order to be happy. A good credit score will open doors to all your dreams, plus some airline miles. But if you are a bad slave and don’t pay the slave master on time, then you get a bad credit score, which means you need to buy cool stuff with cash. If you pay cash, then you cannot buy as much cool stuff. That’s bad because marketers tell us that without cool stuff we can’t have happiness. After my financial meltdown, my credit score fell so low that I became “unrated,” without any score. Being unrated on your credit is like a movie getting a NC-17 rating. The movie might be cool, but it’s best to just stay away. If the movie had only been a little more conformist, then the movie could have gotten an R or PG13, ratings more akin to a good credit score and a strong box office. If you Debt Cleanse, you will wreck your credit. You might even become “unrated” like I was. You may never be able to buy on credit again and only buy with cash. This is great. Embrace bad credit and your improving finances. Forewarn your friends and family that your creditors may reach out to them in order to get your contact information, or at least some clues. Advise them to say nothing except to ask the creditor to no longer call them. The FDCPA only permits creditors to call each third-party once in order to request contact information, unless the third-party authorizes additional calls. The easiest strategy is to hang up. If your friend or family member is willing to be bolder, they could ask something like, “What is the important business matter? I really need to know what’s going on. I’m his BFF, so you can tell me. Is this about his debts?” If the caller gets loose and shares something, have your friend or family member notate the conversation’s contents in a log, as this is a likely a FDCPA violation. As part of each premium plan, members receive a monthly one-on-one call with an attorney trained in DebtCleanse tactics, plus 25% off legal fees for additional legal work. We want to provide members the resources necessary to settle their debts at big discounts, and not pay some at all. The discounts you may be able to achieve can be substantial. Picture this: if a thousand Bank of America credit card borrowers each owe $5,000 and stop paying, then Bank of America will likely eventually sell those debts for around 4 cents on the dollar, roughly $200 each. The debt buyer, typically, will then aggressively pursue those 1,000 borrowers, collecting the full $5,000 plus interest and charges on some, and getting zero on others. Average recovery is usually 20%, in this case, $1 million on the $5 million (1,000 x $5,000) in credit card debt. After deducting the $200,000 paid for the debt, the costs of aggressively collecting can eat up a decent chunk of the $800,000 difference. As an alternative, non-paying credit card borrowers may offer to settle their $5,000 debts for $400. The debt buyer will make less, but get paid faster and with minimum expense. Importantly, the debt buyer may recognize that if they want to start getting aggressive, you are prepared to fight back. A debt buyer that decides to book a modest profit by taking your $400 is making a better business decision than choosing to scuffle, resulting in increased costs and an uncertain outcome. To help you prepare for eventual creditor battles, debtcleanse.com enables you to save all the documents, correspondence, and call notes for each debt in one location. You can also compare representations between holders of your debts over time and look for errors and deficiencies. You can opt to share access to your debtcleanse.com debt files with your attorney(s) and, whether you or your lawyer are reviewing the documents, having everything in one place makes identifying deficiencies more convenient. This streamlining should help minimize the time your attorneys spend on your case, which should reduce legal costs. The DebtCleanse platform also offers template letters to dispute and validate, or prove the existence of, your debts. You can generate the letters from within the website, check the appropriate boxes, print out, sign and mail. You can dispute a debt, prepare a Qualified Written Request (a long tedious request for information and documents on mortgages), request an administrative hearing and documents on a student loan, and more. Debtors can connect with other local DebtCleanse participants and arrange to meet, organize debt strikes, and otherwise support each other in person. Debtors can expect to be bombarded by creditors as they undergo their Debt Cleanse. Debtcleanse.com provides tools for debtors to get ready for combat. The goal in arming oneself is to resolve the debts, avoid skirmishes, and be prepared if a confrontation occurs. Some creditors may furnish you a 1099-C on the amount of your debt that is cancelled. If you owe $5,000 on a credit card and you settle for $400, then you could receive a 1099-C for the $4,600 difference. In some circumstances, you could be required to pay tax on this $4,600. Thankfully, the Internal Revenue Service provides that “if you are insolvent when the debt is cancelled, some or all of the cancelled debt may not be taxable to you. You are insolvent when your total debts are more than the fair market value of your total assets.” If your liabilities exceed your assets—as is common for the majority of Americans—you will not be taxed on forgiven debt. Additional assets may include bank accounts, other types of personal property, retirement accounts, and any other real estate. Other liabilities could include personal loans, credit lines, personal property loans, and mortgages on any other real estate. If you can document that you were insolvent when the debt was forgiven, then you likely do not need to pay taxes on the forgiven debt, even if you receive a 1099-C.
Stop dreaming of debt freedom and take action. Click here to download the Quick Start Guide and take your first steps on your path to a debt-free life. If you're ready to take the next steps on the path to freedom from unaffordable debt, reach out to us and one of our support experts will be happy to help. Fill out the form below or call 800-500-0908. *That said, many Creditors abide by the FDCPA as this is considered a prudent practice to limit litigation from consumers. Additionally, many states have enacted consumer protection laws that may overlap and be even more stringent than FDCPA. These often govern Creditors in addition to Debt Buyers and Debt Collectors. When you gather information and documentation using the strategies in this book, your attorney (should you end up in a lawsuit) can review your records for FDCPA violations and other deficiencies that might create leverage in negotiating a settlement. This originally appeared in the DebtCleanse book, which contains chapters on how to use the DebtCleanse method to get out of specific types of debt.